Due to an unique printing technology are SwiftColor card printers extremely fast and high quality products - even for oversize card prints. SwiftColor is a devision by Kanematsu, a leading printing manufacturer in asia. 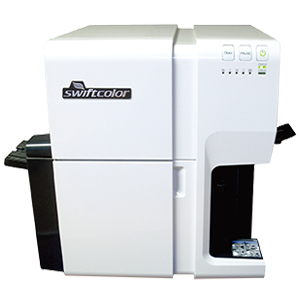 By any standards, SwiftColor card printers satisfy all expectations. 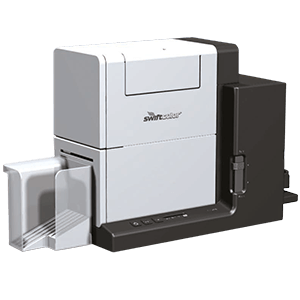 Up to 3,000 plastic cards or 6,000 plastic cards (deducting maintenance) can be printed with the SCC-2000D and SCC-4000D card printer per hour. At the same time, ordinary card printing systems produce 300 cards/h to significant higher average unit costs only. Even oversize, XL and XXL-badges are available, as well as printing on paper cards for e. g. business cards! Re-experience card business with our all-in-one SwiftColor card solutions for events, accreditation, tickets, personalization and many more applications.